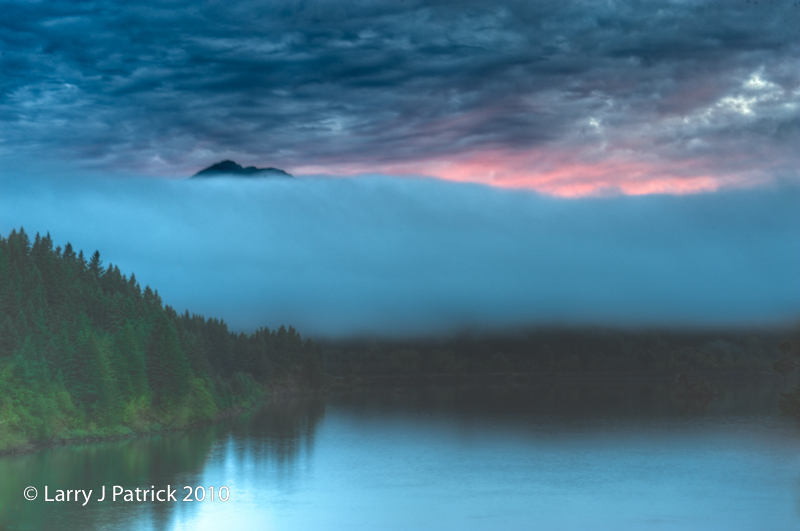 Early morning along the Columbia River brings fog, low and high clouds and the colors of sunrise. I really like how the whole scene appeared in three distinct layers—the fog, the low cloud, touch of color from the sunrise and the high clouds. As I sat with my coffee and camera, I wanted to capture all these elements. I tried various exposures however I could never get the fog along the river looking like I was seeing it. This photo is the best of the lot. Camera settings: Nikon D3 on a tripod, Nikon 24-70mm f/2.8 shot at 70mm, ISO 200, f/11 and 1/30th of a second. Lightroom—Set black and white points, increased mid-tone contrast and changed saturation of various colors. Cool pix. Love the layers within it. Very nice! Love the scenic layers and great color pairs (Blue and Green, Cyan and Magenta)! Based upon this photo I am ready to head to Oregon. Beautiful. The colors seem somewhat muted but that may be due to the early morning. Like the simple composition. I like this one a lot. It shows a lot about the nature of this area in a very simple form. I like the pix however something seems to be missing from it. It needs a central focus point. Seems like it's missing the most important part -- the payoff in the center. I like the top and bottom, which makes you want to get that wow from the horizon even more.